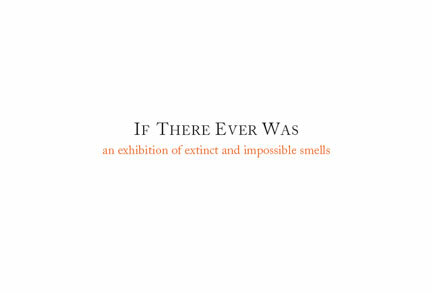 Cuchifritos Gallery is proud to host, If There Ever Was: an exhibition of extinct and impossible smells. Like a cabinet of intangible curiosities, the seven scents re-created for this exhibition are drawn from disparate stories throughout history for which few, if any, tangible objects remain. At Cuchifritos you will be able to experience a range of phenomena around which contemporary culture is continually revolving from the acrid surface of the sun to the atomic blast at Hiroshima. The French essayist of the sixteenth century, Michel de Montaige, once wrote that, of the senses, smell is best “used to fit us for contemplation.” It is with this understanding of scent as a means of interpretation and, as would follow, integral to the perception of abstraction that Robert Blackson, curator of the exhibition, began inviting some of the most renowned and trained “noses” in fragrance design to create the exhibition’s “olfactory images”. Although scent is considered the essence of physical presence and often lends proof to our surroundings, the scents of If There Ever Was are inspired by absence. And although it would be would easy to pass the exhibition off as a work of pure fantasy – the product of an over-active perfumer’s imagination – beneath the olfactory theatricality lies a serious scientific basis, says James Wong, a botanist at Botanic Gardens Conservation International (BGCI, UK), who contributed to the exhibit. For the exhibition, Wong helped to recreate the bouquet of four extinct flowering plants by trawling through an extensive list of extinct flowers and plants to identify entries that were closely-related to existing scented species. He then combined historical reports of how these extinct plants smelt, with the fragrance of their living relatives, to remix the specific ancient aroma. If There Ever Was is supported by Reg Vardy Gallery, The University of Sunderland, UK; Givaudan, Symrise, International Flavors & Fragrances, and Omega Ingredients.